Controllers are a much discussed area in Nn3 and Z scale. Marklin mechanisms, while well engineered, have a rather poor motor design. The basic motor has a 3 pole armature and is prone to "cogging" - when the armature is rotated, it jumps from pole to pole, feeling like a rather bouncy ratchet. To overcome this and achieve fine control and good slow running, it's necessary to use a feedback controller which senses what the motor is doing and electrically smooths out the kicks by varying the voltage and current in a series of pulses. The downside of this is that the motors can get very warm indeed. This is because common designs of feedback controllers give the motor a full voltage and current pulse. In the UK, this happens with the AMR, ECM and Gaugemaster makes of feedback controllers. Getting a Marklin (or any motor really) hot is not a good thing. The mechanical solution is to raise the gearing to something like 70:1 so the motor spins fast. A fast turning motor draws less current and stays cooler than a slow turning one. However, not everyone has the means or skill to achieve this. So the next best answer is to drown the problem in electronics instead. 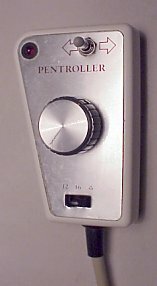 My preferred controllers are the Pentroller range, designed and built by Stewart Hine, originally for Pendon Museum, but now available from Stewart, built to order. These feature a high frequency pulse which makes the motors run cooler, but still give very fine control. 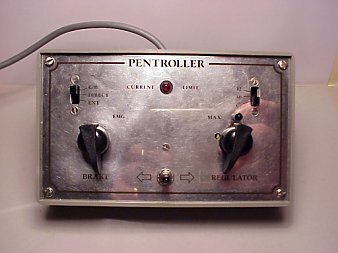 This is the hand-held Pentroller. Externally, it's a very simple design, but inside the box is a significant amount of electronics. It has overload protection and the current output can be switched to suit various types of coreless motors as well as iron cored (the type fitted to Marklin locos). The three settings available give 100 mA, 250 mA and 1A approximately. Using this controller, I find that I can run 8800/8864 chassis locos for long periods on the "Pizza" without them getting unduly warm. Previously, I had used an AMR controller, which while giving excellent slow speed control, would heat the locos until they were almost too hot to hold. Stewart can modify the controllers to specifically suit Marklin mechanisms, but I find they work OK on the standard settings. This is the coast and brake version. If you have a reasonable length of run, it's great fun to use. In coast and brake mode, you have no direct control of the loco. Instead you have a regulator and a brake. Open the regulator and the loco starts to move. Leave it open and it will accelerate, close it and the loco will coast. To stop, you have to use the brake. Done correctly, nice smooth stops and starts are possible. Of course, it's possible to get in a horrible mess too with a runaway loco, but full emergency braking is available! It's switchable for different motor types and again uses high frequency pulses, so the motors keep their cool. Current limits are as for the hand-held version. All Pentrollers need a source of low voltage AC, in theory 14 to 18 volts. Here's my solution. It's a modified "wall-wart" transformer from an old Oric Atmos computer. Some of these transformers are sealed mouldings but in this case it wasn't, so I could easily take it apart and remove the rectifier/regulator to provide a simple 12 volt AC output. This is a simple task to do, but if you aren't sure about working with mains current, then it's best to seek qualified advice. Another thing to do is change the low voltage connector. 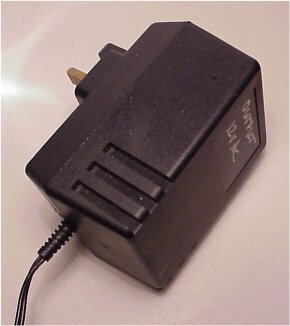 The sort of devices these things usually power may not appreciate a dose of unregulated AC, so to avoid this, I've used a 2 pin DIN plug instead of the standard DC connectors, plus I've also clearly marked "Output 12V AC" on the casing. Using a 12 volt AC feed, means that after taking into account losses inside the controller circuit, track voltage is a maximum of 9 to 10 volts which is about right, especially considering the low current output. The Pentrollers specify a 14 to 18 volt feed, but in practice, seem happy with 12. So those are my preferences for controllers. There are other designs that work well. Do-it-yourselfers might like to take a look at the "Cooler Crawler" design which seems to offer similar capabilities to the Pentrollers. Even if you have little electronics experience, following the design carefully and logically means that you should be able to build yourself a suitable controller. Now, on to wiring. Hand laying track means that you need to create a wiring system to suit as well. Now this is an area where people often struggle and it's non uncommon to see layouts with huge bundles of unnecessary wiring in myriads of colours. I believe that for a "narrow-gauge" style of layout, this isn't needed. My layouts are wired with wired reclaimed from scrapped twisted-pair network cable, which gives me 4 colours, red, black, green and white. So my scheme is red and black for track wiring, white for common areas like crossings, and green for AC. If your mind throws a wobbler when trying to figure out how to wire a layout, then there is a simple answer. Take a red pen and a black pen, tape them together and draw out the track plan, taking care to keep either the red or black towards the bottom of the page. Now take a look at the plan. There will be areas where the red and black meet, primarily at crossings. This is where switches are needed to set the polarity of the crossing. Take a look at the turnout picture on the left. The three different coloured areas are the basic electrical units of the turnout. When the turnout is set for the blue road, then the green centre will need to be connected to the red side. When the turnout is set for the red road, then the green section is switched to the blue connection. This means some form of changeover switch is required. Point motors normally have this built-in, but I use manual point operation, so a change-over switch is required. I either use a microswitch operated by the mechanism, or a simple slide switch, to which is added a link to throw the point. Now say the red road is a siding or dead-end. All that's required with this scheme is to ensure the rails are connected through. When the point is set for the siding, it will be live. When set for the main road, it will be electrically dead. Simple, isn't it? Only if you want the road to be live will it need extra wiring, in which case, don't connect the rails to back the turnout. A word on rail joiners - I don't use 'em, as they're not available for the code 40 rail I use. Rail to rail continuity wiring is done through the PCB sleeper via a link under the baseboard. In any case, it's a bad idea to rely on rail joiners for continuity anyway. Here is a worked example, in this case the control system for the Pizza, which is a very simple layout. 3. a small section of tag strip. I like to use this as it's easy to add extra wires if needed in future. 4. from the tag strip, the wires lead to a changeover slide switch which operates the point and switches the crossing polarity. The switch head is drilled and a pin is pushed in up to the point tiebar. 7. Simple mechanical link to the slide switch.